At Large Cabin Rentals, we are very proud to offer families and guests some of the best large family cabin rentals in Pigeon Forge and Gatlinburg. These spaces ideal for any church group, family reunion, friends retreat or corporate function. There is no group too big or too small to stay inside our large cabin rentals. Now, that being said, if you have not had a chance to experience a peaceful vacation inside one of our large cabins, you may be wondering what exactly you should expect. That is why we have put together a brief breakdown of all the amazing benefits our large cabins have to offer. Just like their title suggests, our large family cabin rentals in Pigeon Forge offers a ton of relaxing space for families and guests to stretch out. Unlike other rentals, these cabins have a ton of room that makes sure that visitors don’t feel cramped or as if they are staying on top of each other. Instead, here, visitors will love having their own private bedroom, unwinding in the spacious open-aired living room, or relaxing in a rocking chair on your cabin’s private deck overlooking the Smoky Mountains. It will feel as if you are staying in your own private vacation home. 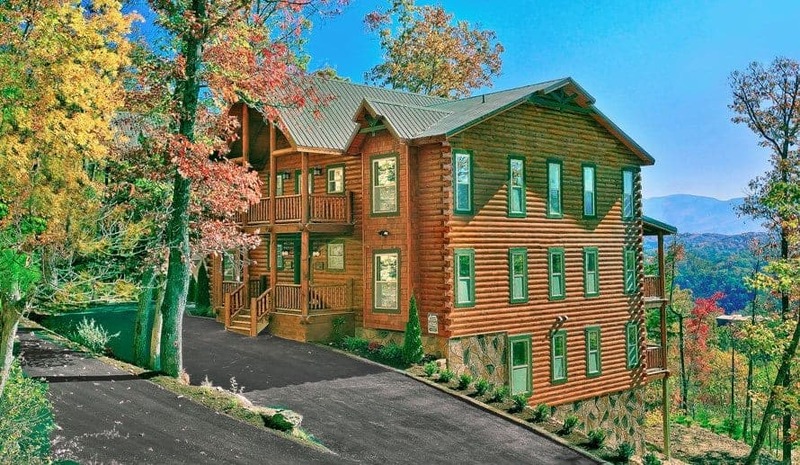 A little-known fact about our large family cabin rentals in Pigeon Forge is that they offer some of the most luxurious amenities in our inventory. In addition to offering an outdoor hot tub, relaxing fireplace, and fully-equipped kitchen, many of our large cabins also offer exclusive access to our resort outdoor pools, exercise facility, private barbeque area, home theater room, game room, pool table, indoor putt-putt course, and much more! In addition to the upgraded amenities and spacious layout, guests will enjoy staying in our large family cabin rentals in Pigeon Forge because they offer an unbeatable relaxing space to unwind. Whether you choose to take a quick nap in the comforting living room or if you want to sit back and enjoy the scenic views from your private deck, we can guarantee that you will not be disappointed in the relaxing atmosphere these cabins offer. For more information on the space our large family cabins rentals in Pigeon Forge offer, be sure to click ‘play’ on the video below! When you are traveling in large groups, it is not uncommon to have to change your plans a little bit. Whether it be because the weather isn’t cooperating or someone you are traveling with isn’t feeling well, it is very important to be flexible. That being said, having to tweak your travel plans a little won’t be too inconvenient thanks to all the great entertaining amenities these cabins offer that we mentioned earlier. They are also just a short drive from all of the thrilling attractions, shops, shows and theaters in Pigeon Forge and the Smoky Mountains. Last, but not least, families and guests should expect to have a ton of fun when they stay inside one of our large family cabin rentals in Pigeon Forge. Not only do you get to spend this time with your loved ones, but you also get to experience all of the fun and exciting things that Pigeon Forge and the Smokies have to offer. If you would like even more tips on renting a large family cabin rental in Pigeon forge, be sure to give our vacation experts a call at the number above. Not only will they be able to answer all of your questions, but they will also be able to help guide your search to find which of our large Pigeon Forge cabin rentals is right for your next vacation.